Can You Lower FSH Levels With Health Foods & Herbs? Both men and women produce follicle stimulating hormone, or FSH, which plays an important role in a woman's ability to get pregnant. In women, this hormone, produced by the pituitary gland, signals the ovaries to produce an egg-containing follicle each month. As you age, your FSH level rises. Some herbs and health foods claim to reduce FSH levels, which might increase your odds of getting pregnant in some cases. Do not take herbs or health foods to lower FSH without talking first to your medical practitioner. As you age, your ovaries contain fewer normal eggs. Your FSH level rises in an attempt to signal the ovary to mature an egg. An FSH level greater than 10 mIU/mL can indicate a decreased ovarian reserve of "good" eggs. Lowering FSH may or may not help the ovaries produce a viable egg. A lower FSH level will not increase the number of viable eggs left in the ovary. However, chronically high FSH levels can interfere with the ovary's ability to respond to this hormone to produce an egg each month. Lowering FSH levels could increase the chances of the ovary maturing a viable follicle, according to an article published in the May 2000 issue of "Human Reproduction." Traditional Chinese medicine treats infertility, including infertility associated with high FSH levels, with a blend of herbs. Acupuncture might also be part of the treatment plan. A case study published in the December 2012 issue of "Medical Acupuncture" reported that several blends of Chinese herbs, given in the menstrual, follicular and postovulation phases of the menstrual cycle along with acupuncture, lowered a patient's FSH from 14.5 mIU to 8.7 mIU over a 3-month treatment period. However, pregnancy did not occur. Consult a licensed traditional Chinese medicine practitioner if you want to try Chinese herbs, as certain herbs are given at different points in the menstrual cycle. Some herbs have gained a reputation for being helpful with infertility, including red clover and Agnus castus, also known as vitex or chasteberry. However, despite their popularity as alternative treatments for infertility, neither has been clinically proved to be effective in lowering FSH. Vitex has shown some benefit by decreasing prolactin levels and lengthening the luteal phase of the menstrual cycle, according to a 2013 review of studies published in "Planta Medica." High prolactin levels can interfere with follicle stimulation, while a shortened luteal phase can interfere with implantation of an embryo. 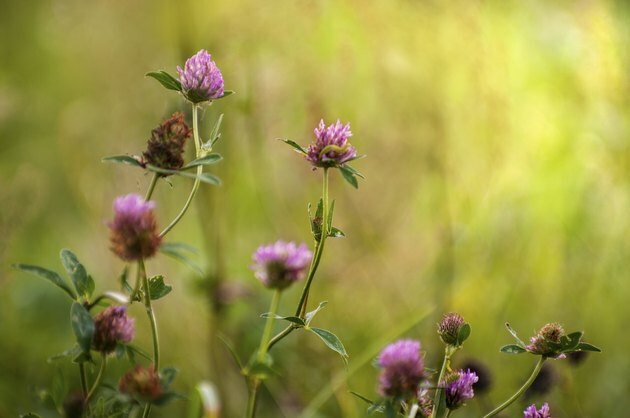 Red clover has estrogenic properties, meaning it can have estrogen-like effects in activating estrogen receptors. A rise in estrogen is generally accompanied by a fall in FSH. No studies have proved that red clover has this effect, however. A study published in the 2011 "Obstetrics and Gynecology International" noted that, when taking red clover, postmenopausal women reported an improvement in menopause symptoms associated with low estrogen levels. Eating an overall healthy diet, one low in trans fats and higher in vegetable proteins rather than animal fats, appears to improve fertility in general, according to a July 2013 "Reproductive Biology and Endocrinology" article, although it hasn't been specifically proved to lower FSH. Specific health foods, such as wheatgrass, have long histories of use as alternative infertility treatments. Proponents believe that its high chlorophyll content contributes to its actions as an antioxidant. However, there is no scientific evidence that wheatgrass lowers FSH or has any other specific effect on menstrual dysfunctions that lead to infertility.